The Millennium Bridge is a steel suspension footbridge over the River Thames between Bankside and the City of London. 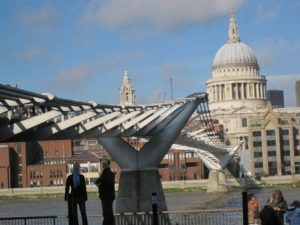 It lies between Southwark Bridge to the east and Blackfriars Railway Bridge to the west and is a useful crossing point for those wishing to walk between Shakespeare’s Globe Theatre or Tate Modern on the south bank of the river and St Paul’s Cathedral to the north. The bridge is an elegant low-slung structure designed by Norman Fosterand Antony Caro. The official title of the bridge is the London Millennium Footbridge but it was nicknamed the Wobbly Bridge because when it was opened in June 2000 people using it noticed a strange swaying motion from side to side – it became quite a sensation with local people who made special trips to try it out. After two days the bridge was closed and was not reopened until 2002 during which time modifications were made to damp down the effect. Today the bridge is a lovely route to take across the Thames although sadly it is now quite stable.